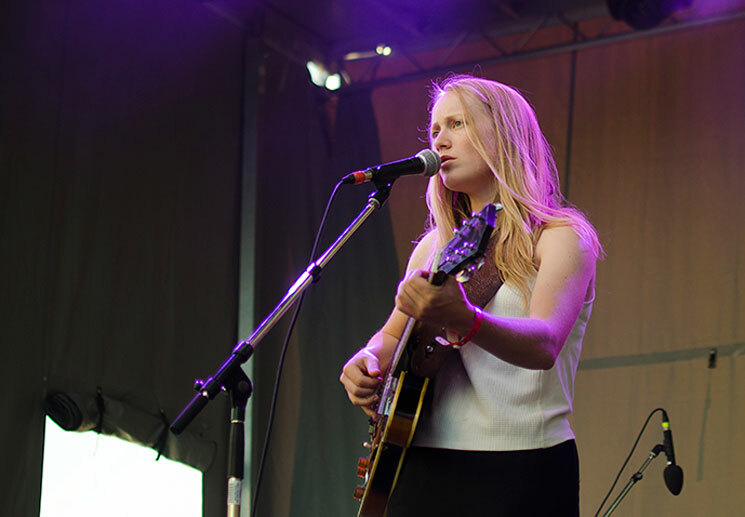 Taking the stage by herself in starting the early evening set, the nation's capital got an intimate look at Tamara Lindeman's formidable songwriting chops as the Weather Station. The crowd was entranced from the very start by her smooth, steady vocal delivery that captured the weight of her every word. Such a strong trait was only bolstered by Lindeman's incredibly intricate finger picking, not missing a single note in making the clean tones of her semi-hollow electric ring out. A small, yet talented backing band further supported Lindeman, adding much more depth to her compositions than the sum of their parts may have indicated. Drummer Ian Kehoe's precise kitwork was an exercise in restraint, never overpowering Lindeman's vocals or the busy bass lines of Ben Whiteley in the slightest. Adrian Cook got to flash his pedal steel solo skill a handful of times, though his steady swells remained incredibly complementary to set highlights "All of It Was Mine" and the galloping closer "Way It Is, Way It Could Be."